This list provides an overview of books concerning topics in music education. Books concerned with specific methods can also be found in the "instrumental" section. Mastering Piano Technique: A Guide for Students, Teachers, and Performers. Seymour Fink, Donald G. Bell (Illustrator). Amadeus Press. 1992. ISBN 0931340462 (hardcover). This holistic approach to the keyboard, based on a sound understanding of the relationship between physical function and musical purpose, is an invaluable resource for pianists and teachers. 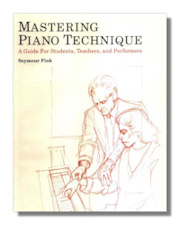 Professor Fink explains his ideas and demonstrates his innovative developmental exercises that set the pianist free to express the most profound musical ideas. Music in Higher Education: An Annotated Bibliography. Edward Brookhart. Harmony Press (College Music Society. 1988. ISBN 0899900429 (hardcover). Articles about the place and function of music in institutinos of higher education with comments. # 10 in the series series Bibliograhies in American Music. You've Got Rhythm: Read Music Better by Feeling the Beat. Anna and Joan Harkness Dembska. Flying Leap Music. 2002. ISBN 1930664044 (paperback). You've Got Rhythm makes reading music feel natural because you feel the beat as you learn to read. It tackles music-reading problems at the root – by focusing on rhythm- while teaching step-by-step, from basic notation to advanced rhythmic skills. With elegance and humor, You've Got Rhythm turns the frustration of rhythm problems into an enjoyable musical and literary experience!. 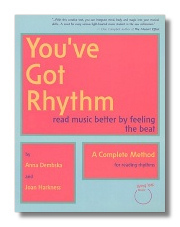 The Rhythm Book - Studies in Rhythmic Reading and Principles. Peter Hampton Phillips. Dover Publications. 1995. ISBN 0486286932 (paperback). Textbook familiarizes readers with the signs, symbols, and units of rhythmic notation. With drills, exercises, musical examples, special sections on conducting technique, sight-singing and musical notation. Music for the Piano: A handbook of Concert and Teaching Material from 1580-1952. James Friskin, with Irwin Freundlich. Dover Publications. 1973. ISBN 0486229181 (paperback). Lists descriptions, classifications, technical aspects of both famous and little-known compositions for piano.